The electric parking brake equipment applies the parking brake using an electric motor. When the electric parking brake is applied, the electric parking brake switch indicator light turns on. If the vehicle is driven with the parking brake applied, the brake parts may generate heat and the brake system may not operate, leading to an accident. Before driving, release the electric parking brake and verify that the brake system warning light is turned off. The electric parking brake cannot be applied or released while the vehicle battery is dead. An operation sound occurs when applying or releasing the electric parking brake, however, this does not indicate a malfunction. If the electric parking brake is not used for long periods, an automatic inspection of the system is performed while the vehicle is parked. An operation sound can be heard, however, this does not indicate a problem. When the electric parking brake is applied and the ignition is switched OFF, an operation sound can be heard, however, this does not indicate a problem. The brake pedal may move while the electric parking brake is being applied or released, however, this does not indicate a problem. If the electric parking brake switch is continually pulled while driving the vehicle, the electric parking brake will be applied and the electric parking brake warning beep will be activated. When the switch is released, the electric parking brake is released and the beep stops. If the electric parking brake is applied with the ignition switched off or in ACC, the brake system warning light in the instrument cluster and the indicator light in the switch may turn on for 15 seconds. When running the vehicle through an automatic car wash, it may be necessary to switch the ignition off with the parking brake released depending on the type of automatic car wash. The electric parking brake can be applied regardless of the ignition switch position. Securely depress the brake pedal and pull up the electric parking brake switch. The electric parking brake is applied and the brake system warning light and the electric parking brake switch indicator light turn on. The electric parking brake can be released while the ignition is switched ON or the engine is running. When the electric parking brake is released, the brake system warning light and the electric parking brake switch indicator light turn off. Securely depress the brake pedal and press down the electric parking brake switch. Firmly depress the brake pedal and press the electric parking brake switch. 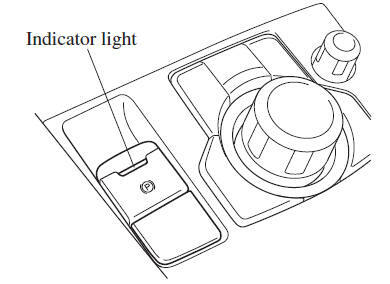 If the electric parking brake switch is pressed without depressing the brake pedal, the display or indicator light in the instrument cluster notifies the driver that the brake is not depressed. A message is displayed on the multiinformation display in the instrument cluster. The brake pedal operation demand indicator light in the instrument cluster turns on. If the accelerator pedal is depressed with the electric parking brake applied and all of the following conditions met, the parking brake is released automatically. The driver's seat belt is fastened. The change lever is in a position other than neutral.